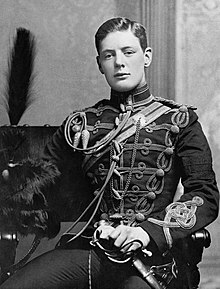 Winston Churchill while serving as a cornet in the 4th Queen's Own Hussars (1895). Churchill's formal rank was second lieutenant. It was abolished in the Cardwell Reforms of 1871 and replaced by sub-lieutenant. It is equivalent to a modern second lieutenant. The term today is restricted to internal regimental use when referring to a Second Lieutenant in the Blues and Royals and Queen's Royal Hussars. This rank was also used in other countries, e.g., in the Russian Empire, and the Prussian cavalry, before 1870. The rank was in use by the time of the English Civil War. Among famous cornets in that conflict were George Joyce, Robert Stetson, and Ninian Beall. It was abolished along with the purchase of commissions in the Army Reform Act of 1871, replaced by second lieutenant. The ranks of ensign and cornet were abolished in the US Army in 1815. The rank also existed in other nation's cavalry troops, such as those of Sweden (kornett) and Imperial Russia (корнет), and by the Continental Army in the American War of Independence. General Alexander Macomb was initially commissioned a cornet in a career in which he eventually became Commanding General of the United States Army. It is still used in the artillery and cavalry divisions of the Netherlands (kornet). The rank of field cornet (veldkornet) was used for the senior officer of a ward or sub-district in the independent republican states of the Transvaal and Oranje-Vrystaat in late 19th century South Africa. They were elected by the commandos of their ward for periods of three years. In the case of large wards, an assistant field cornet could also be chosen. The rank was reminiscent of the Dutch use in cavalry troops that the commandos most closely resembled. In apartheid-era South Africa, the rank of field cornet was used in the South African Army from 1960 to 1968. The subaltern rank of cornet was the equivalent of the contemporary infantry rank of ensign, today's second lieutenant in each. The cornet carried the troop standard, known as a "guidon". ^ "No. 26600". The London Gazette. 19 February 1895. p. 1001. ^ "The Armed Forces (Forms of Address)". Debretts. Retrieved March 2, 2018. ^ Colonel Ninian Beall. (1937). Caleb Clarke Magruder. Records of the Columbia Historical Society. Vol. 37/38. pp. 17-29. ^ Bell, William Gardner, Commanding Generals and Chiefs of Staff, 1775–2005: Portraits & Biographical Sketches of the United States Army's Senior Officer (Washington, D.C.: Center of Military History, U.S. Army, 2006). ISBN 0-16-072376-0. ^ "A dictionary of South African English on historical principles". Dictionary Unit for South African English - Rhodes University. ^ Duxbury, G. R. (June 1968). "Changes in Ranks and Designations in the South African Defence Force". Military History Journal. The South African Military History Society. 1 (2). ISSN 0026-4016. This page was last edited on 25 March 2018, at 18:21 (UTC).